Akureyri is a town in northern Iceland. It is Iceland's second largest urban area and fourth largest municipality. Nicknamed the Capital of North Iceland, Akureyri is an important port and fishing centre. The town is located at the end of a long fjord known as Pollurinn and is surrounded by high mountains. Akureyri is a very picturesque town with its location by a scenic fjord, eclectic building styles and streets winding their way through gorges. Visitors can walk around the town centre, see the impressive church and check out Listagilið (literally: "the art canyon"), home to a number of arts and crafts galleries and shops. The tranquil municipal botanical garden, Lystigarðurinn, is worth visiting, as are the several small museums dotted around town. Travel Links – Akureyri Airport, one of four international airports in Iceland and the only international airport in the north of the country. The current airport is mostly used for domestic flights, with seasonal scheduled international flights. 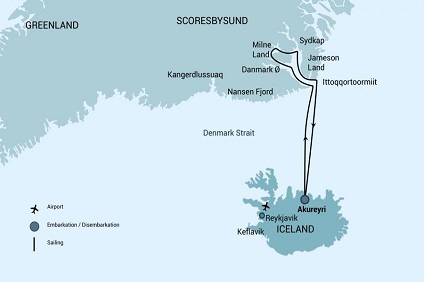 Air Iceland flies several times a day to Reykjavík, and there are also flights to Grimsey, Vopnafjörður and Þórshöfn. Buses between Reykjavík and Akureyri are operated by Sterna, while buses from Egilsstaðir and various other towns to the east of Akureyri are operated by SBA. 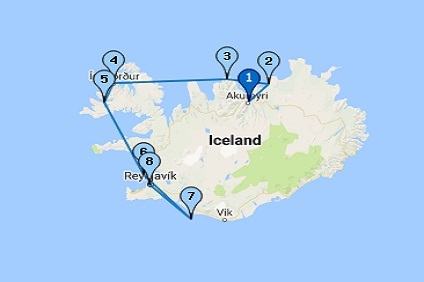 7 Night Cruise sailing from Akureyri to Reykjavik aboard Panorama. 8 Night Cruise sailing from Akureyri roundtrip aboard Hondius. 7 Night Cruise sailing from Akureyri roundtrip aboard Plancius. 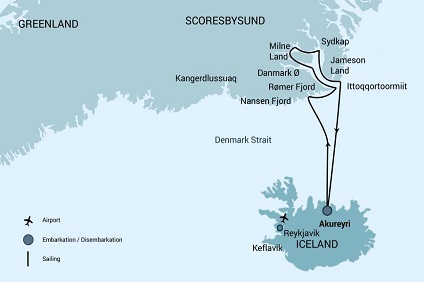 7 Night Cruise sailing from Akureyri roundtrip aboard Hondius.